Twenty-two year-old Brenda was born in Sayaxche, Peten in Guatemala. When she was five, Brenda moved with her parents and five siblings to Los Reyes, San Andres, Peten, located far from her extended family in Sayaxche. Los Reyes was a very small, isolated town, and the only transportation to and from it was one bus that ran at four in the morning. Right before Brenda started second grade, her father made it clear that his belief was that women did not need school and that their responsibilities were only in the home. Despite this, Brenda continued her studies. That same year, family problems caused the separation of her parents, and Brenda moved back to Sayaxche with her mother and siblings while her father stayed in Los Reyes. In Sayaxche, she lived with her grandmother for a short time before being taken to a government home called the Temporary Home of Zacapa. Officials there decided that Brenda and her sisters could not return to live with their mother, but had to stay until they turned eighteen. Brenda did not finish school that year, and she was then sent to a girls’ school to finish third grade. In 2014, Brenda began her university studies. 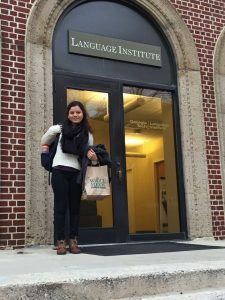 She has successfully completed three years of Business Administration, and this year she went to Atlanta to study English at Georgia Tech from January to May. She is grateful to be enjoying her experience in another country and getting to know new cultures. Brenda has had to strive for everything she has achieved in her life—including going to college and studying in the United States—but her efforts have been successful with the help of the Boys Hope Girls Hope Guatemala affiliate. Luis was raised by his grandmother and uncle from a very young age. His grandmother is a seamstress and his uncle is a farmer who plants and sells pineapples. They both come from a village named El Jocotillo Villa Canales. Luis managed to graduate from elementary school in his village and had the desire to continue studying, but his family did not have the resources to pay for middle school studies. So he started working in the mornings with his uncle by planting and selling pineapples, and in the evenings he went to school. 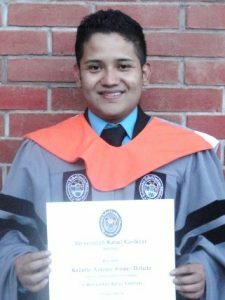 Luis earned a scholarship from the Ministry of Education because of his good grades. The support helped him finish the public middle school. Luis graduated with a degree in Business Administration from the University Rafael Landívar. Currently he works for a prestigious financial corporation as the Assistant of the Regional Manager. Rodolfo comes from a place full of gangs and problems where people has to fight daily to survive. In November 2003 he started a new life, he says. That's when he came to Esperanza Juvenil. A priest who was worried about him contacted the authorities of Esperanza Juvenil and told them about Rodolfo. As time went on he went through many difficulties with his family. One of his brothers was murdered in 2005, another in 2006 and the last one in 2007. They were victims of their own neighborhood, a marginal area where gangs rule. In 2007 his high school graduation helped him to overcome this crisis in his life. Knowing he had a chance to go to college helped him move on, he says. Starting college in 2008 changed my life in a different way. In the last five years I have had fabulous experiences. I have had many challenges - personal and academic - but that has made me stronger and has helped me fight for my dream. Now I have completed one of my main dreams - graduating from college. 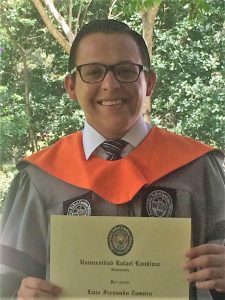 Rodolfo earned his business degree from Universidad Rafael Landívar in 2013. He is now working at a Canadian services company, and leading the Esperanza Juvenil Alumni group. Help more scholars to achieve success!